We’d love your help. Let us know what’s wrong with this preview of Beyond Common Sense by Eugene Borgida. Beyond Common Sense addresses the many important and controversial issues that arise from the use of psychological and social science in the courtroom. Each chapter identifies areas of scientific agreement and disagreement, and discusses how psychological science advances our understanding of human behavior beyond common sense. 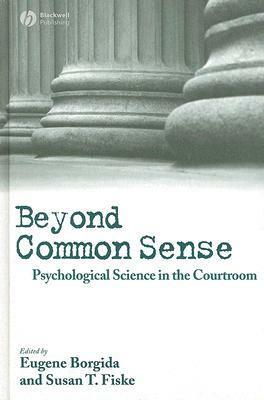 Features original chapters written by some of Beyond Common Sense addresses the many important and controversial issues that arise from the use of psychological and social science in the courtroom. Each chapter identifies areas of scientific agreement and disagreement, and discusses how psychological science advances our understanding of human behavior beyond common sense. To ask other readers questions about Beyond Common Sense, please sign up. This is a set of crystal clear essays that line up current social psychology science and search for ways to apply it in the court room. It explains how unconscious bias in even the most well-meaning liberal white's psyche poisons race relations, how implicit stereotypes contribute to the paucity of women in certain male-dominated employment, and the mistaken assumptions by jurors and judges with respect to false confessions, witness testimony, race in profiling and sentencing, and the effectiven This is a set of crystal clear essays that line up current social psychology science and search for ways to apply it in the court room. It explains how unconscious bias in even the most well-meaning liberal white's psyche poisons race relations, how implicit stereotypes contribute to the paucity of women in certain male-dominated employment, and the mistaken assumptions by jurors and judges with respect to false confessions, witness testimony, race in profiling and sentencing, and the effectiveness of reporting sexual harassment to your employer. It rounds out with several criticisms, pointing out problems these findings face in the court room. Beyond Common Sense presents the science in a very accessible fashion. The legal issues the science raises are too numerous to cover comprehensibly in the book, but some of the chapters toward the end bring up the big issues. For instance, one contributor argues persuasively that antidiscrimination law is concerned less with actual discrimination and more with a general sense of unfairness toward a particular person or group. Another discusses how new evidentiary laws and other protections (like mandatory videotaping of interrogations) may be necessary to ensure the reliability of confessions.